A screen shot of Mark Riddell's since-deleted bio on IMG's web page. In July 2018, college admissions con artist William Rick Singer allegedly reached out to Mark Riddell with a problem. Their scheme to help the son of one of Singer’s clients ace his ACT exam was in jeopardy of falling through. According to a federal indictment released Tuesday, Singer had arranged a few weeks earlier for the student to take the ACT at a Houston public high school, where the exam would be proctored by an administrator he knew. Singer would then pay Riddell to secretly correct the student’s answers on the completed test and pay the administrator to allow him to do so. When the student fell ill in July and was unable to travel to Houston as planned, Singer, his client and Riddell allegedly concocted a fall-back plan. The 36-year-old Riddell would just cut out the middle step and take the exam in the student’s place. On July 13, Singer allegedly provided a sample of his client’s son’s handwriting so that Riddell could learn to imitate it. The next day, the test administrator allegedly gave the ACT exam to Riddell, who completed it in his hotel room. Of all the cringe-inducing tales of privilege and corruption in the college admissions bribery case that federal investigators uncovered, the above story could be among the most impactful. 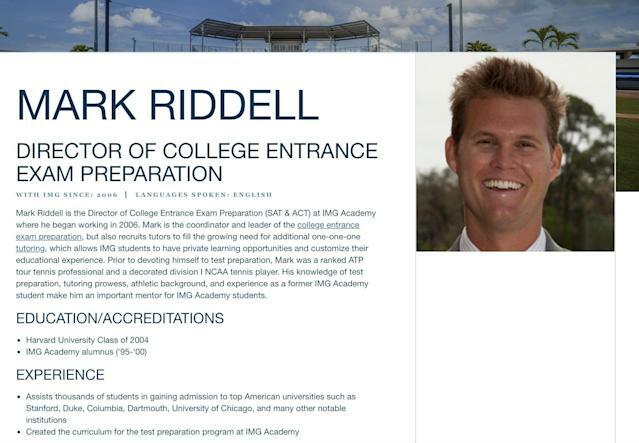 That’s because Riddell is the director of college entrance exam preparation at IMG Academy, the famed Florida prep school that serves as a springboard for elite high school athletes pursuing college scholarships from Division I programs. Riddell has been charged with two counts of fraud for allegedly conspiring with Singer for the past eight years to secretly take SAT and ACT exams in place of actual students or replace students’ answers with those of his own. Department of Justice documents appear to identify Riddell as a cooperating witness who has been working with the government since February in exchange for leniency. “There needs to be a broad-based re-inspection of every test score they achieved, every course they took and who taught those courses,” said Gerald Gurney, assistant professor of higher education at the University of Oklahoma and longtime advocate for reform in college sports. IMG head of school Chris Locke could be reached for comment by Yahoo Sports, while IMG football coach Kevin Wright declined comment. The school announced Tuesday night it had suspended Riddell indefinitely after learning of the allegations against him earlier that day. “With the current information at hand, we have no reason to believe this alleged misconduct extends beyond Mr. Riddell, nor do we believe that these actions have any direct relation to Academy students, parents, or staff,” the school said in a statement released Wednesday evening. It’s difficult to ascertain which of the academy’s athletes worked closely with Riddell, himself an IMG grad who played Division I tennis at Harvard from 2000-04. IMG regularly produces Division I athletes in numerous sports, from football, to basketball, to baseball, to tennis. Five of the top 60 basketball prospects in the 2019 Rivals rankings attend IMG Academy, including McDonald’s All-Americans who are headed to North Carolina, Villanova and Arizona. IMG also boasts three of the top 10 football prospects in the Class of 2019: Georgia-bound linebacker Nolan Smith and Alabama-bound running back Trey Sanders and offensive lineman Evan Neal. In the hours since the Department of Justice disclosed its findings, no colleges have announced plans to investigate the validity of test scores attained by former IMG athletes. Miami, Florida State and Alabama are among the universities with at least a handful of IMG graduates on their football teams. The NCAA did not comment specifically on the charges against Riddell or a potential investigation into the eligibility of former IMG athletes. It instead released a general statement on Tuesday regarding the Department of Justice’s findings, which detailed how Singer manipulated the admissions process at prestigious universities by bribing college coaches and administrators in exchange for their assistance. "The charges brought forth today are troubling and should be a concern for all of higher education,” the NCAA statement read. “We are looking into these allegations to determine the extent to which NCAA rules may have been violated." Only Singer and Riddell can say how many test scores were falsified, but one passage from the Department of Justice documents makes it clear they had done this scheme often. After Riddell finished taking the ACT exam in his Houston hotel room last July, he called Singer and predicted he’d gotten a 35 out of 36. Sure enough, that was exactly his score.